Head Coach Tim Mulqueen and his players finished up a three week away trip with a 1-1 draw last weekend at North Carolina FC. 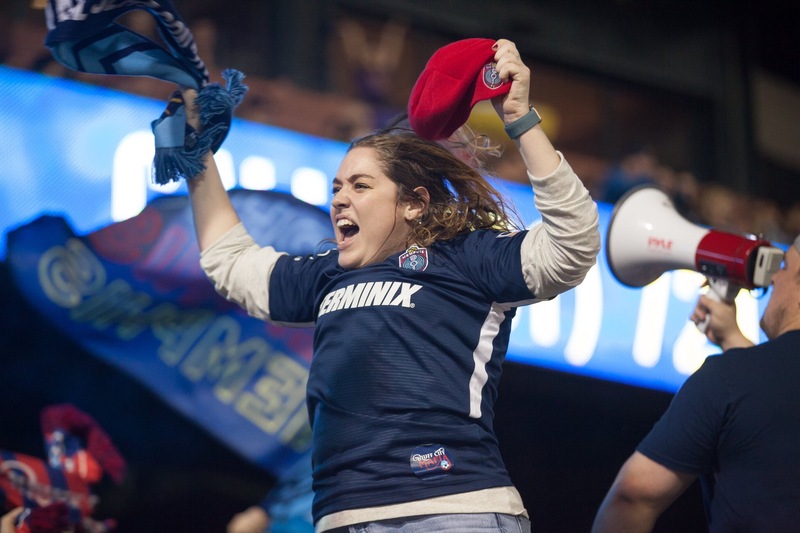 Wednesday night, Memphis returns home the AutoZone Park to take on Eastern Conference foes, Atlanta United FC. Both teams have one win with Memphis sitting 11th in the Eastern Conference and ATL United II are right behind in the 12th spot. The match marks 901 FC’s third home match pf the season. Through two home matches a combined 16,000 fans were in attendance. Atlanta, through four matches, have not gotten off to an ideal start. They have one win, two losses and one draw. Last weekend, St Louis FC, thanks to a two-goal first half, handed Atlanta their second loss of the season. Less than 10 minutes into the first half, Saint Louis received a penalty after a controversial fall call on Atlanta defender Jack Metcalf. The controversial penalty took the life out of Atlanta and they never recovered, eventually losing 0-2. The Five Stripes commenced the 2019 season with a 2-0 home win over bottom-of-the table Hartford Athletic. The two teams combined for 32 shots and ATL’s Brandon Vázquez capped of the match with a quality solo goal 10 minutes before fulltime. With four matches played, a few players are obvious standouts on the ATL roster, including Romario Williams and Anderson Asiedu. Williams, named after Brazil legend Romario, was picked third in the 2015 MLS SuperDraft. He signed for Atlanta United in 2017 and scored one goal in 17 MLS appearances. ATL United loaned the striker to the Charleston Battery in 2017 where he excelled, scoring 17 goals through 22 matches. He played nine matches for ATL United II and scored seven goals. The Jamaican international started his 2019 campaign with three goals in the six-goal thriller against Charlotte. His second half goal in the third minute of stoppage time helped ATL United II earn a point. Another key player on Atlanta’s roster is Ghanaian midfielder, Anderson Asiedu is the engine that powers Atlanta’s midfield. Asiedu, who played for Monmouth and UCLA in college, was drafted by Atlanta United in the 2019 MLS SuperDraft. Atlanta United loaned the Ghanaian to Atlanta United II this season and Asiedu has two assist through four starts.